e.g. ‘the democracy of the city needs strong participation as well as elected representation’; ‘relational localism – removing hierarchies, embracing risk, co-production and communities in the lead’. Where are things getting stuck? Doesn’t the Council really mean what it seems to be saying, or is there an inconsistency of interpretation which leaves individual councillors vulnerable in some way? 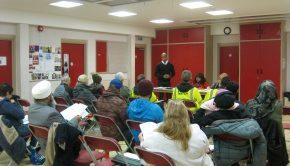 Amongst residents there is a steady growth in voluntary action – particularly around crime and environmental issues. But some see this as a dangerous trend, which shows acceptance of austerity cuts and undermines the case for properly funded public services, and say that residents should put more energy into discussion and campaigning on policy issues (ironically, to some degree, filling gaps left by the reduction in officers supporting ‘governance’ activity). 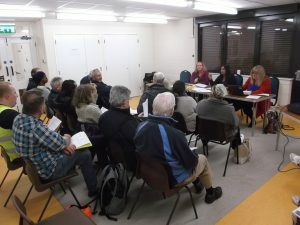 Amidst all this the local police team continue to have real impacts on dysfunctional HMO’s and fly-tipping, and to be part of the resident groundswell in not just action but in relationship building as well (half of those attending the meeting were involved in the Streetwatch scheme). Following ‘workshop-style’ seating at the last meeting, we reverted to the traditional style of councillor/officers behind a table at the front and the ‘audience’ in rows facing them. There is something about this layout which inhibits movement towards a shared approach to the issues between councillor/council/residents, which continues the ‘adversarial’ process where residents made demands and promises were made about action which would be taken on their behalf. Now that residents are looking to be part of the action, a circular seating arrangement would reflect and encourage a shared approach. A ‘plan’ would turn this list into a set of actions and outcomes. In fact, action is already taking place on several of the issues – it is a matter of deciding how much gets written down and by who. 2. HMO’s/Supported Housing. The Housing Scrutiny Committee have been conducting an investigation into HMO’s and are due to produce a report in the near future which draws on learning from ‘pilot areas’ such as Stockland Green and Soho as well the experience of other cities such as Liverpool. 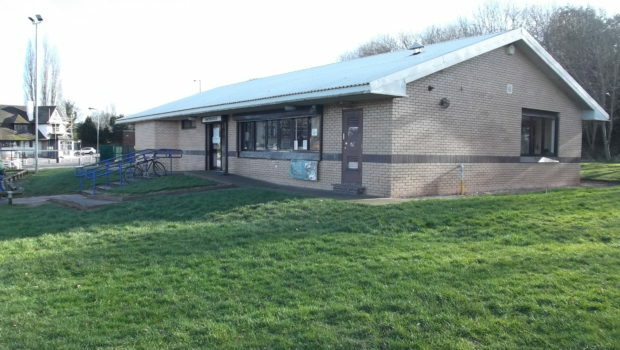 The report will go to all councillors so may be available for discussion at the next meeting. In the meantime both councillors and residents will keep track of progress towards the formation of a city-wide forum which will provide the opportunity to test how far policy changes at both local and central government levels can produce improvements in quality of life within local wards. The Handsworth Wood Police Team, and particularly the PCSO’s Sam Shaw and Jade Snookes, continue to have big impacts on HMO’s which have anti-social behaviour and rubbish problems. They have had 5 unsuitable properties closed down in the last 6 months, and are currently working with a further 12 properties spread across Cornwall Rd, Oxhill Rd, Friary Rd, Windermere Rd, Endwood Court Rd, Somerset Rd and Stockwell Rd. They follow a structured 6 stage approach which moves through warnings to short-term closures to 3 month closures. If this doesn’t resolve the issues a further stage of criminal prosecution and fines can be implemented. Residents with concerns about a property should contact the police team as soon as possible (handsworthwood@west-midlands.pnn.police.uk). 3. Fly-tipping and Noise. 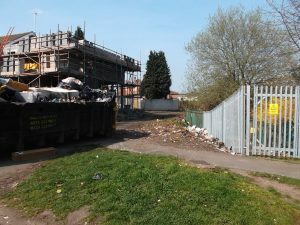 Team work between residents and councillor, but most outstandingly from PCSO Sam Shaw, has finally achieved progress on the appalling level of rubbish dumping near the Friary Road/Oxhill Road junction (see picture above). Ownership and responsibility have been clarified, initial clearance carried out, skip in place and further clean-up to come. It was clarified that for prosecution for tipping to be successful there had to be people who had witnessed it taking place and who were prepared to make statements. 4. Vehicle Crime. This is the only type of crime showing an increase, and the local police team are varying their shift patterns to counteract it during the most risky periods. There may be a link to people previously convicted and jailed now having returned to the community. Concerns were raised about anti-social motorbike activity late at night, and Sam Shaw said she would talk to Sgt. McGrath about whether this also warranted some alteration of shift patterns. 5. Car Dumping from Oxhill Rd. 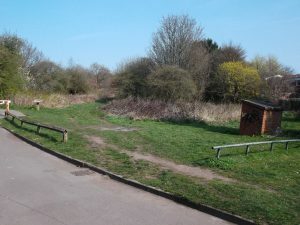 Resident George Wheeler asked if consideration could be given to some kind of fencing to prevent stolen cars being driven up into Sandwell Valley from the end of Oxhill Road and set on fire (Inside Handsworth comment: what risks might this pose in a period of hot dry weather?). It typically takes many months to get an unsightly derelict car removed. There was no clear response to this during the meeting, but we hope for one before the next meeting. 6. Feedback on Local Innovation Projects. Dave Conroy from Liberty CIC gave feedback on work done by Spring Housing with their £8,000 grant. They worked as a ‘helper agency’ to identify ideas that local people wanted to implement and then help them acquire the knowledge and skills to get the funding to make it possible. They met with several difficulties: their grant being halved at short notice, people needing more help than was anticipated, a lack of sharing and evaluation across the wider programme, and the failure of a subsequent bid they made for £100,000 to the Reaching Communities programme. 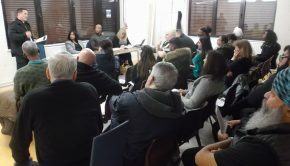 They have learned a lot about the area, and would like to go to a further stage of working to encourage ‘street by street’ organisation to address issues and build cohesion. 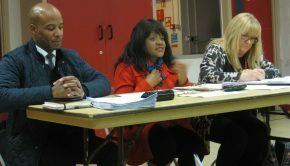 Dilbagh Dhami reported on the use of the £12, 780 given to Handsworth Wood Community Development Trust. 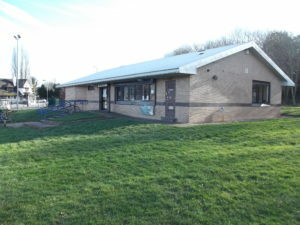 The main benefit has been the contribution towards the cost of bringing the derelict Hamstead Pavilion back into use. 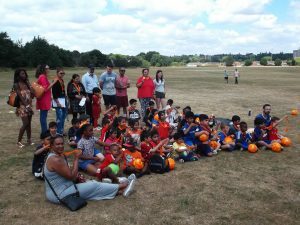 Some of the activities made possible by this are: ward forum and other meetings, free computer access and help with business development and job search, bhangra classes, yoga and meditation sessions, learning to cycle sessions, young people’s football, ‘walk and talk’ and a jumping off point for led walks into Sandwell Valley, ongoing income generation from groups, businesses and private individuals wanting to book the space. 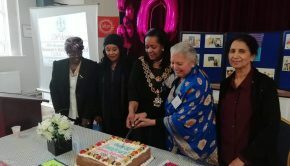 A quarter of the funding was given to the Women’s Help Centre on Rookery Road to help them continue to provide their services for a little longer.